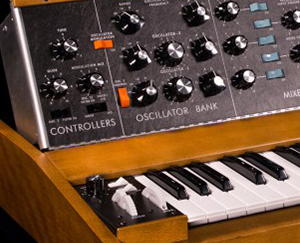 As the Minimoog has collected some of the world's influential artists such as Gary Numan, Herbie Hancock and many more, it appears the synthesizer has given an individuality to their sounds and created new genres of music. It's re-release on to the market underlines a very significant shift in the world of studio technology to the once defunct now seen as 'authentic' analog equipment. With vinyl production off the charts, modern day electronic artists such as Daft Punk and Disclosure have helped bring such equipment back into prominence. In brief, The Minimoog Model D is one that has been handcrafted by the lovely people at the Moog Factory in Asheville, NC. It's monophonic, 3-oscillator, analog synthesizer is housed within the locally sourced Appalachian hard-wood enclosure and hand finished aluminium chassis. The design is very 1970's and even uses the same component placement as the original. Whilst no big changes have been made to the original sound or audio signal path, the Minimoog Model D now has a range of popular functional modifications that allow the Minimoog to expand with its perfect sonic capabilities. Some of the modifications include a premium Fatar keyboard with velocity and after pressure available via the top panel CV jacks. An analog LFO with a triangle and square waveshape, CV outputs for pitch, velocity, gate and after pressure. It also has basic MIDI integration, and a mixer overload modification which when used allows the Minimoog Model D to create thicker and far more greater sounds than before. As per the manufacturer's advice to future buyers, the sheer complexity behind the building of each unit coupled with the high demand for them, the Minimoog's are tumbling off the shelves at a painstakingly slow rate and the to a rather hefty tune of £3000+ but rest assured, audiophiles and electro-heads far and wide will be joining this lengthy queue. Watch this space, New-New-Wave is on the horizon!